This one's got humour and horses that fly. Princess Andra volunteers to act as bait for the dragon ravaging her father’s lands, on condition that she is released from an arrangement to marry a foreign prince. GENRE: Comic fantasy (age 9-12). £5.00 Publication date: September 2012. If you're going to have a meet cute story, it might as well involve a dragon bait damsel and a blase rescuer. Princess Andra doesn't want to marry some strange foreign prince so she does a deal with her Dad, the King. She'll volunteer to be a sacrifice to the evil dragon; if she survives she is free to not marry. So, this spunky, intrepid gal heads out and ends up being rescued by some guy who is more interested in doing field work on the dragon than romantic work on the Princess. The Princess, the Rescuer, and the Dragon trade snappy one-liners and engage in madcap hi-jinks before the plot winds up at a predictable but perfectly satisfying conclusion. All three main characters are engaging, if lightly sketched in. As you might expect, the Dragon is the star and gets all of the best lines. There are a number of very clever set pieces. The dragon's huffy dismissal of the Princess's rather plain jewels, (she knows the difference between diamond and diamanté, thank you very much), is a riot. And everyone gets a fair share of wry, and sometimes edgy, throwaway lines. This is all rounded out by a large cast of supporting characters, each of whom gets a bit of amusing attention. ***** Dragon Bait...sooo much fun! An easy read that draws you into a lovely, light tale in a fairy tale land. A great bedtime story. 27 Aug 2012 Amazon USA. 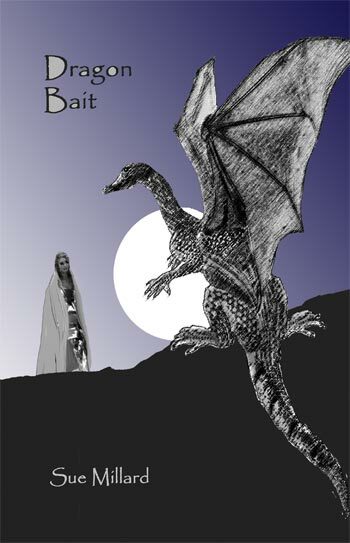 ***** Dragon Bait really has it all -- an unlikely Princess, talking Dragons, flying horses and mules, intrigue and misunderstanding, a Hero in disguise and a happy ending. 23 Aug 2012 Amazon USA.